It must have been lets pretend we work for the American People Day over at the Department of Justice. Newly appointed United States Attorney General Loretta Lynch dropped the hammer on World Cup Soccer Executives, issuing warrants for their arrests regarding the accumulation of over 150 million dollars received by employing methods of racketeering,money laundering, and wire fraud. The head of this notorious Soccer empire, Sepp Blatter, will remain untouched. High drama in the court of public opinion. Bread and Circus historically serves as a huge distraction while the real criminals mingle in smoke filled rooms, holding the puppet strings of law enforcement that knows full well how they arrived at their position and where the real line is drawn. And so it goes, while the world watches Soccer executives scurrying out like rats. No arrests…No warrants…nothing is done to the instigators of a far greater recent scandal that dealt punishing blows to the economy. (Business Insider) Six banks have agreed to pay a combined $5.8 billion to the Justice Department and other regulators. Five of them have pleaded guilty to criminal charges. Citicorp, JPMorgan, Barclays, and RBS are pleading guilty to charges tied to forex manipulation, while UBS is pleading guilty to interest-rate manipulation charges. They have each agreed to a three-year corporate probation period. No scurrying executives, no impending jail time, just a laughable corporate probation period. Who cares if the most powerful banks colluded on rigging interest rates to make billions of dollars. Our Defense Department squanders billions of taxpayer money, The TPP is on the fast track to establish A Corporacratic New World Order, The same cadre of criminals that crashed the economy in 2008 were merely slapped on the old wrist after being caught rigging interest rates, and world governments are colluding to imprison the population with a digital currency that will enslave anyone that doesn’t adhere to the impending New World Order system run by a group of elite scum that would become far more powerful than anything we have ever imagined in our worst nightmares. But twisting a few media moguls arms to squeeze out bribes within an industry built on kicking a ball around a field is far more important? Tags: Bribery, Corruption, FIFA, Scandal. 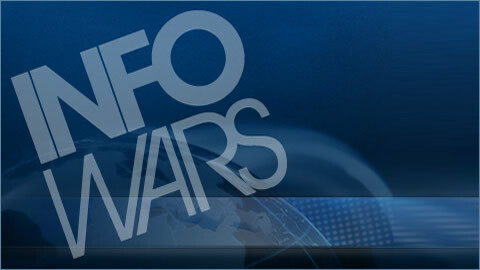 Friday: The Infowars Nightly News: Highlights from the Muhammad cartoon contest in Phoenix, AZ.